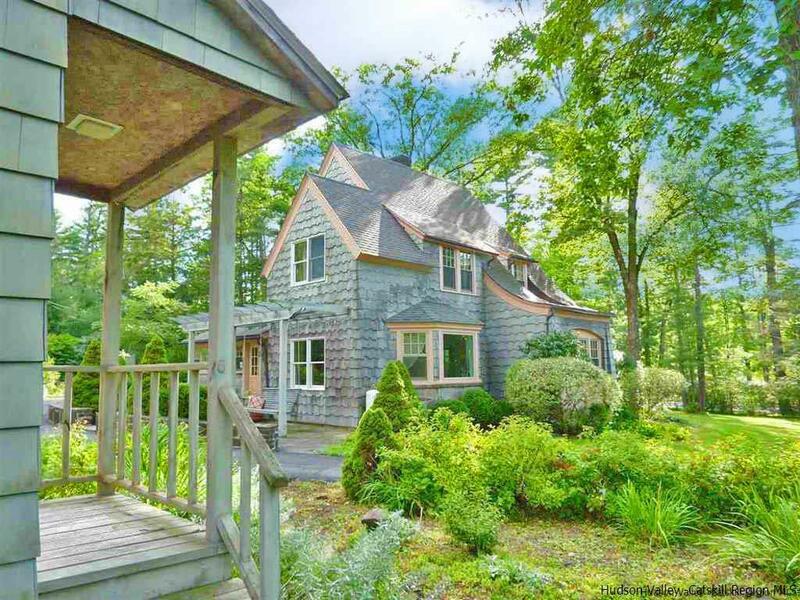 An iconic and stately compound located just as you arrive into Woodstock with storybook style and loaded with charm and character both inside and out. Just a mile from town and set back from the road, this well loved beauty sited on 6 acres has been updated in just the right places. An expanded and super well equipped kitchen welcomes you and your guests from the bluestone patio and pergola. Once inside, the flow is open and easy from the heart of the home to the living, dining and den areas. Windows abound and many archways add architectural interest and warmth. In addition to the three amply sized bedrooms in the main house, there is a finished studio apartment above the garage suitable for a legal rental, extra guest/nanny space or office. The ground floor level is zoned as a 3rd living unit or rental if one desires. It has a full bath in place, and just requires sheetrock and flooring. This could make a fantastic art studio or work space as well. The grounds offer many opportunities for gardening, or simply enjoying nature and the paved circular driveway provides easy and elegant access. Municipal water, room for a pool and tennis court and Onteora Schools. Make this happy home yours!